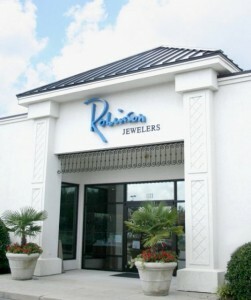 Robinson Jewelers was first founded in 1969 by Floyd G. Robinson. The doors first opened in downtown Greenville on Evans Street as a watch repair and jewelry store. Floyd’s son, Mike, took over the store in 1985 and maintained his father’s vision by continuing to offer fine jewelry sales and jewelry repair. In 2002, Mike relocated the store to where it now stands in Arlington Village. Mike now works side-by-side with his son, Justin, as they continue to serve their customers the way Floyd would have wanted. As the in-house jeweler, Justin continuously strives to repair and restore your most treasured pieces so that they can once again be worn and enjoyed. Mike continues to serve his customers in the Robinson way by building trust and integrity with each customer. Today, Mike has tremendously grown the store’s inventory to include a wide variety of engagement and fashion jewelry, watches, sterling silver, and much more. The Robinson Jewelers staff strives to make every experience an enjoyable one. If you want to just look, then look! If you want to take your time to select that perfect piece, then we will be happy to take our time with you. Our goal is to always leave you with a smile on your face.